Jump on board for a look at the third year of The Odd Couple! This set compiles all 23 episodes from the program’s 1972-73 season. I’ll look at them in the order broadcast, which is how they appear on the DVDs. The plot synopses come straight from the package. If nothing else, I love “Hallelujah” for Oscar’s fake dating name of “Andre LaPlume”; I may have to steal that one. That’s not the only positive about this excellent show, though, as it scores plenty of laughs. I particularly like Felix’s obsession with Oscar’s “average” looks and their bickering over that subject. It’s a solid show, though I wonder whatever happened to Oscar’s old girlfriend Nancy? Sometimes when a guest star appears on a show, that series bends over backwards to make the person look good. That happens a little too much in “Big Mouth”. While it shows Cosell’s patented surly side and musters some amusement there, it also spends too much time with Nice Howard, the guy who lets a kid do play-by-play. Oscar also seems to get over his hatred for Cosell awfully easily as the show progresses. These elements make this a spotty but still enjoyable episode. Is it just me or does it seem out of character for Oscar to be so intimidated by royalty? He never struck me as a guy who’d be awed by a crown, and “Princess” becomes awkward due to that concept. The whole idea of the mismatched “slob and the princess” idea is just a little too trite for my liking, and I don’t think this episode ever really goes anywhere. The rest of “Pen” could stink but it’d still be worthwhile just to hear Felix’s crummy poems like “Ode to a Skyscraper”. Excessively eager and self-involved Felix is always funny Felix, so Randall’s shenanigans help carry this one. It never quite becomes an inspired episode, but it works. Am I the only one who thinks “Monks” is a little too similar to the “fat farm” episode from Season Two? No, they’re not identical, but they have more similarities than I’d like. The earlier show is superior to this one, though, as “Monks” is a bit lackluster. Some of the other brothers are amusing – I particularly like the one with the megaphone factory – but overall this is an average show. Didn’t we already see this story back in Season One’s “Bunny Is Missing Down By the Lake”? Actually, the cabin setting creates the main similarity between the two, as the episodes go on very different paths. “Dying” probably offers the more entertaining show, as it presents a slew of amusing bits. From the sight of Randall re-peeling a banana to Klugman typing while he tap-dances, this one consistently entertains. It’s always good to see Brett Somers as Blanche again, even within a goofy context like this. The show follows a pretty inevitable path and doesn’t offer anything really fresh or creative. Nonetheless, it produces the requisite laughs and emerges as a successful episode. I don’t think Deacon Jones could actually act, but since “Commercial” mainly requires him to be silent and aloof, he does fine here. The show works best when it plays his unresponsiveness off of Felix’s excessive eagerness; Jones and Randall show a great chemistry in those sequences. There’s a lot of funny material on display here. Flashback episodes always create some issues given the series’ terrible continuity, but they usually entertain quite well. “Baby” definitely falls into that category, as it uses Felix’s nervousness to great comedic effect. If anything, Randall plays him as more uptight and persnickety than usual, and he always amuses. This becomes another fine program. I’m with Oscar on this one, as I hate surprise parties. I like that “Birthday” gives us a better look at some secondary characters, although it seems strange that Felix needs them to investigate Oscar’s past; shouldn’t he know more about his best pal’s life? Anyway, Randall again carries the day with his antics, and the climactic party is a winner as well. The best Odd Couple moments always come from the interactions between Randall and Klugman, and we find a great example of that with “Password”. At the start, we get Felix’s pathetic – but funny – attempts to seem “average”, and the end offers the hilariously off-kilter game show segment in which Felix and Oscar try to play Password on TV. With plenty of other terrific moments in between, “Password” is a classic. “Father” loses points due to a change in actor. Pamelyn Ferdin originally played Edna in Season Two, but here Doney Oatman replaces her. I much preferred the spunky Ferdin to the dishwater dull Oatman, and this episode’s Edna seems somewhat stupid, to be honest. The show also gets a moderately negative appraisal due to its similarities to the episode in which Felix becomes son Leonard’s football coach; it’s not a carbon copy, but it does feel like a rehash. Still, the amusingly non-PC scenes with the little people and the wonderfully vague spouting of “hack around/here and there/this and that” – phrases I like to use myself – make this one decent despite those flaws. I think I’d enjoy “Roomers” more if I actually liked Lisa. The show posits her as the perfect woman, but there’s something about her that I find strangely unappealing; she’s so perky she seems demented. That factor renders “Roomers” less effective, though it does muster some laughs. Déjà vu Moment: back when I reviewed Season One’s “They Use Horseradish, Don’t They?” I wrote “Recipe thief Barbara really isn’t particularly attractive, so it becomes tough to see her as a femme fatale.” History repeats here, as the bland Marlyn Mason played both Barbara and Lisa. She didn’t become more appealing in the two years between episodes. The series works best when it pits Oscar against Felix and highlights their friction. That comes to the forefront with the excellent “Ocean”. The scenario presents plenty of great laughs, and even the scenes prior to those on the ship amuse. All that and the return of Dr. Melnitz too! Now there’s a concept chock full of comedic potential – does “Gotta” live up to expectations? Yeah, but not as consistently as I’d like. “Gotta” gives us more than a few good laughs, especially when Klugman plays Felix. To my surprise, he’s better in that role than Randall is as Oscar. This isn’t a great episode, but it’s perfectly entertaining. While better known for its verbal humor, The Odd Couple can pull off physical gags too, as demonstrated with the excellent bit when Oscar tries to rouse an exhausted Felix. Unger’s intense anxiety about his fate also provides fine laughs, and this turns into a terrific show. Although The Odd Couple usually stunk in terms of continuity, I’ll give it credit this time, as it set up Myrna’s tap-dancing in advance; “The First Baby” sets up that notion. It’s nice to see a show that highlights a secondary character. The series didn’t do this often, so it’s a fun change of pace. Add to that the amusement found in Felix’s predictably pathetic attempt to be Myrna’s manager and there’s a lot to like here. When Felix is annoying, it’s usually in a funny way. Unfortunately, whenever high culture becomes the subject, Felix turns into a less amusing kind of irritating. He seems a little too naïve and stupid here, to be honest, and it bugs me that Felix pesters Oscar so much for his money. It’s not a bad show, but it’s also not one that does a ton for me. I’m not sure why, but I’ve always been very amused by the title of the Broadway show; for some reason, Kiss My Face tickles me. As does the rest of this excellent show. Parts of it remind me a little too much of another court-based episode from Season One, but it differs enough to be a winner. Without question, “Deal” takes an awfully contrived path to send Felix and Oscar onto the game show. However, it’s worth it if just to see the insanely large hole Oscar burned into Felix’s bed. Quite a few other laughs come out as well; for reasons unknown, I always find myself delighted with the fake names of “Ozzie Malone” and “Frederick Ungman”. This is a very strong episode. I’m used to seeing casting changes on The Odd Couple, as there’s not much consistency; like I mentioned earlier, Doney Oatman replaced Pamelyn Ferdin as Edna. However, at least the actors stayed the same within one season, while Oscar’s mother changes from Jane Dulo to Elvia Allman after only 15 episodes! I like Dulo much better, as Allman seems a little too classy to be Oscar’s mom. “Odyssey” drags for other reasons as well. We get too much of the cutesy Greek family and not enough of our usual leads. The Greeks don’t substitute for our heroes, and the attempts at humor tend to be silly and dopey. There’s too much quaint Greek culture and not enough actual comedy in this forgettable episode; it goes down as my pick for S3’s worst show, especially as it comes lodged between two great ones. To this day, my friend Kevin and I remain on the hunt for “modern furniture” as absurd as the pieces Felix selects. We both find much amusement in those ridiculous items, though I must admit I think Oscar’s choices actually look just fine! (I guess that tells you which Odd Couple character most fits me.) “Furniture” offers a simply terrific episode. Funny how the Season One poker buddies essentially vanished over the years – except for Murray. Sure, we got a brief look at Speed in “Let’s Make a Deal”, but Murray is the only one who shows up with regularity. And that’s not a bad thing since Al Molinaro was a fine comedic actor, though I always thought the disappearance of the poker buddies seemed weird. Anyway, “Dinner” ends Season 3 on a decent note. At no point does it quite excel, but it provides a reasonably satisfying episode. Oddly, it doesn’t use Molinaro all that well, but Felix’s interference provides some fine laughs, and I love the obnoxious roller derby girls. It’s a good episode but not a great one. Casting weirdness continues here! First Elvia Allman replaces Jane Dulo as Oscar’s mother, so how does the series then use Dulo? As Murray’s wife! That’s just bizarre – and kinda creepy, to boot. 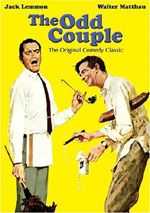 The Odd Couple appears in an aspect ratio of 1.33:1 on these single-sided, double-layered DVDs; due to those dimensions, the image has not been enhanced for 16X9 televisions. Expect a repeat of Season Two’s visuals with these good but erratic transfers. For the most part, sharpness satisfied. The majority of the shows offered nice delineation and clarity. Some softness occasionally interfered, such as during “I Gotta Be Me”; for reasons unknown, that episode came across as moderately soft. Nonetheless, the shows usually looked good. Only minor examples of jaggies and shimmering occurred, and I noticed no edge enhancement. In terms of source flaws, the episodes showed their ups and downs. Some of the programs demonstrated pretty solid cleanliness, while others suffered from more frequent distractions. The shows occasionally presented specks, blotches and other marks. In general, these weren’t prominent, though, as most of the season offered reasonably clean material. More erratic material came from the colors. In general, I thought the shows boasted pretty good hues, as the tones were usually vivid and lively. Some muddiness occasionally occurred, though not with enough frequency to cause problems. Blacks were dark and dense, while shadows showed nice delineation. All of these factors added up to a “B-“ for visuals. Expect the monaural audio of Season Three to match up with that of the prior year. Once again, speech was inconsistent. The lines always remained intelligible, and they usually seemed acceptably natural. However, sometimes the live filming made the dialogue sound a bit distant, and some edginess occasionally interfered. Still, the speech was perfectly decent most of the time. Effects played a minor role during the shows, so don’t anticipate much from them. Those elements were clear and without notable problems. Music seemed pretty solid, as the score managed some nice range on occasion. The music never really excelled, but it was above average for audio from an older series. I noticed some source defects on occasion. For instance, “The First Baby” suffered from an intermittent high-pitched whine. Other shows demonstrated some noticeable hiss. These issues weren’t constant, though, and they usually failed to distract; that whine was the only really irritating issue. Overall, the audio seemed fairly average for its age. 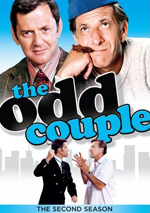 While Season One of The Odd Couple came with some nice extras, Season Three continues the unfortunate trend found with S2 and leaves us with virtually nothing. DVD One opens with a general TV on DVD promo plus specific ads for MacGyver and Adventures of Young Indiana Jones. This continues to be a big disappointment after the quality supplements on the initial set, especially since both S2 and S3 come with the same price tag as that initial release. 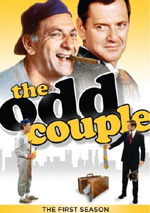 I loved the first two years of The Odd Couple, and Season Three continues that positive trend. A few minor duds emerge, but the majority of the shows amuse. Once again I found picture and audio to be perfectly adequate, though the absence of extras disappoints. 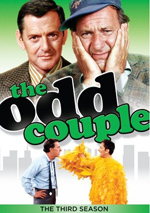 Nonetheless, there’s a lot of great entertainment here, so S3 of The Odd Couple merits my recommendation.